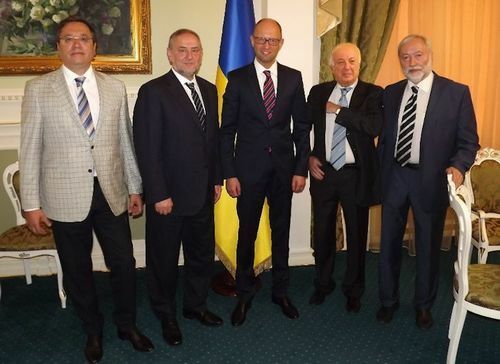 Leaders of the World Jewish Congress (WJC) and the Ukrainian Jewish community held talks today in Kiev with Ukraine’s Prime Minister Arseniy Yatsenyuk and the mayor of Kiev, Vitali Klitschko, to discuss both the situation of Jews in Ukraine and international matters. The WJC delegation included WJC CEO Robert Singer and WJC Vice Presidents Andrey Adamovsky and Boris Fuchsmann, as well as the chairman of the General Council of the Euro-Asian Jewish Congress, Josef Zissels. The WJC delegation and Yatsenyuk also discussed joint concerns with Iran nuclear deal, notably Tehran adhering to its commitments and effective controls by international regulatory bodies. Singer expressed concern about Iran arming groups like Hezbollah and Hamas and about proliferating terrorism. Prime Minister Yatsenyuk pledged to “act in concert with the free world” to ensure that Iran does not gain nuclear weapons capabilities. The group also raised the upcoming anniversary of the Babi Yar massacre carried out by German forces and local collaborators in September 1941, and the planned commemorations of this event. There was agreement that the Ukrainian government, the local Jewish community and the WJC should work together to host an international commemorative event on 29 September 2016, the 75th anniversary of the massacre, in which 33,771 Jews were murdered in a single operation. Also on Thursday, the WJC delegation met separately with the mayor of the Ukrainian capital city of Kiev, Vitali Klitschko, who gave his full support for the preservation of the Babi Yar memorial for future generations and next year’s commemorations of the massacre. On Wednesday, the head of the Ukrainian Orthodox Church (Kiev Patriarchate), Patriarch Filaret, met with the World Jewish Congress leaders.